We are ready for Spring! It seems every year the Dallas Quilt Celebration is the first sign of Spring in our area. We hope that you have plans to attend. We will have our booth spaces #113-115 again this year. Come see the two new and exciting products we will have with us in our booth. Terial Magic is a liquid spray with multiple applications in the sewing industry. For embroidery machine owners--this product is applied to your fabric as a stablizer. For those wanting to make a t-shirt quilt--apply to your t-shirts, iron, cut and sew into your project. For those wanting to use the cameo to cut out fabrics--this product makes your fabric flat and stiff so that your fabric is like a sheet of paper. The designer, Terry McFeely uses this wonderful product to create 3-D flowers with fabric. We will have her display pieces in our booth. Her website contains an abundance of information about her new product. Come see these beautiful floral arrangements and quilts! Below is her 3D Flower quilt. Flowers can be changed out for the season. We were drawn into her booth at International Quilt Market--gorgeous! Ryan Haag is an educator for Silouette America and he will be in our booth showing the wonderful Cameo! We will have a show special. This product has been used in the scrapbooking industry for many years. They have just launched themselves into the sewing world and what a big hit! Pearl Pereira of P3 Designs is using this unit to cut out her freezer paper pieces for all her new projects. She loves it and has been educating her customers during her new free online block of the month project. For those of you with an embroidery machine---all of those svg files convert directly over into the Cameo program. All your applique pieces are ready to cut! Ryan can tell you all about this wonderful product and how it can save you so very much time while perfectly cutting out your fusible applique, freezer paper, Rhinostone stencils...the list goes on. Ryan will be in our store March 6th 1-4 p.m. to have a Silhouette Cameo class. Send us an e-mail if you plan to come. We are excited to have Pearl coming twice in 2014. We have openings in the June 5th day class. If you would like to make one of her retreats, send me an e-mail and I can let you know what is available. Her gorgeous Happy Trails quilt will be in our booth at the Dallas quilt show. Retreats are a great way to master a technique. We have scheduled 2014 retreats to provide a variety of skills needed for quilters today. Pearl will teach freezer paper starch method for applique in June and October. Brenda Jeschke will teach basic embroidery machine skills in May (We are extremely excited about this new offering. Have an embroidery machine you never use? Join Brenda and learn how. She works with ALL type machines and comes highly recommended by other embroidery machine owners.) 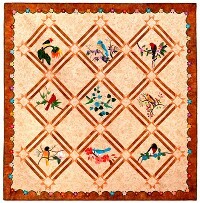 Eileen Urbanek will teach Judy Niemeyer paper piecing patterns in July. Jackie Brown will teach domestic machine quilting in July. We are working with Handi Quilter to provide a long arm quilting retreat (in November after festival) much like what they provide in Utah. Since it is local the price is much more cost effective. We hope you will find one or more of these offering just what you need to advance your skills. Click here to find a link for each retreat on Quiltagious Quarters website. Handi Quilter has just awarded our store the HQ Way award for the third year in a row. We are grateful to all of our customers that have given Handi Quilter positive feedback about how we take care of you. For those of you that find yourself on the verge of making this big decision, we want to be the store to help you. Handi Quilter has started a rotation for the Dallas Quilt show since there are now several dealers in this area. We WILL NOT be running the booth this year at the show. We highly recommend you test drive all long arm models during the quilt show. Please feel free to ask any questions you may have about our pricing during the quilt show when you visit our booth. Before making the purchase please come see us. Currently, we have an Avante demo for sale at a great price. For new units, we will work with you to provide the best price and the best service after your purchase. Thank you for your continued support of our quilt store and retreat center. See our class schedule below. Alice Wilhoit's new applique series begins March 15th-third Saturdays: Be the first to make Alice’s new quilt pattern, “Hummingbirds & Friends”! This lovely 80” x 80” quilt will satisfy any bird lover. Take a closer look --quilt is entered in the Dallas Quilt Show this next weekend. (Take advantage of having this talented local teacher that travels all over the country to teach!) Alice has brought your favorite birds to life using embroidery needlework details. In this 10 month class, she will teach you as many appliqué techniques as you are wanting to learn. We all have our favorite methods that we tend to stick with….this could be the year that you add many more techniques to broaden your knowledge base. In this ten month class, you’ll learn many traditional embroidery stitches plus many more that Alice has developed. These classes are always fun! Reserve your seat now! Note from Alice: "Class is from 10 – 2. Price is $15. I will take cash, check or credit card. Student can pay all up front or monthly. I can run student's credit card. Student needs to make a commitment to be in class and keep up with monthly assignments. When class nears end, I’ll schedule a retreat for those that want to finish with my help." Long Arm Machine Quilting classes by Jackie Brown every Wednesday. Look at our class schedule to see dates for Level 1, Level 2, or Level 3 classes. Jackie starts with beginners in her Level 1 or she can advance your skills in Level 2 or 3. Chenille Class by Lynda Lindstrom Friday April 11th from 9:30-3:30 for $35. Many of you have loved the many panel chenille samples we have throughout the store. Let Lynda show you how to chenille a panel, woven fabrics, or regular cotton fabric. For the panel project she plans to show how to add an outside border the flip and sew method so your whole project is easily done on your sewing machine. Crazy Patch Mantel piece by Alice Wilhoit Thursday March 27th & Thursday May 1st from 10-3 for $50. This is a two session class. What a perfect way to use this wonderful quilting technique. Beautiful sample in store. Pictured online. 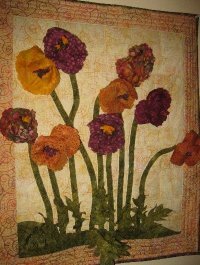 Hand Quilting by Sarah Francis Thursday April 24th or Saturday May 24th from 1-4 for $20. Learn to hand quilt those special projects! Sarah is an award winning hand quilter. Kindergarten Machine Quilting by Lynda Lindstrom Saturday March 22nd from 9:30-3 for $35. This very basic introduction will teach you about battings, fabrics, threads, and how to do simple machine quilting techniques to get those projects done on YOUR sewing machine! Hand Embroidery by Alice Wilhoit Saturday March 29th from 10-4 for $45. Everything you need is furnished in this technique class. Embroidery has become very popular again. So much to learn that make it quicker and lots of fun! Desert Sky Judy Niemeyer class by Eileen Urbanek Saturday April 5th from 9:30-4 for $45. Eileen will teach you many tricks that make these paper piecing projects by Judy SO much easier! Beginner friendly class. Project pictured online. Wool Applique w/silk ribbon embroidery by Alice Wilhoit Thurs. April 10th from 10-4 for $40. Learn to work with wool and embellish with beautiful silk ribbon embroidery. Long Arm Quilting club FIRST Quarter meeting: Saturday April 12th. This club's goal to to bring together long arm quilters in our area. We want to educate, share ideas and have fun. (Discounts on long arm supplies on club day.) Jackie Brown is our lead educator for this club but we plan to bring in some Handi Quilter educators as well. More information coming soon. Double Wedding Ring class by Alice Wilhoit Thurs. April 17th from 10-4 for $40. Try this classic quilting project in a smaller version---tablerunner. See if you like it before starting a larger one. Save time, learn from Alice! Quilt & Connect Machine Quilting class by Lynda Lindstrom Saturday April 26th from 9:30-3 for $35. This is a great way to quilt those larger projects without struggling with the complete quilt top the whole time. Basic Embroidery Machine class by Brenda Jeschke Thursday May 15th from 10-3 for $45. Brenda will teach you how to use the embroidery part of your machine. Any brand! This class covers using the proper stabilizers, how to hoop properly, discuss needles, threads, and bobbins, machine embroidery formats, printing templates, getting your designs to your machine, downloading designs from the internet, and design organization on your computer. Bring machine and laptop. Beginner Class by Lynda Lindstrom Saturday May 10th from 9:30-4 for $40. Ready to start your journey into the world of quilting? Click above to find out more about this class. Want to join? We need to know by Tuesday January21st for class this Saturday. We sew all we can....and we sell the rest!